Tiny Violin is now available either through through iTunes or though the mobile App Store on iPhone / iPod Touch by searching for ‘Tiny Violin’. 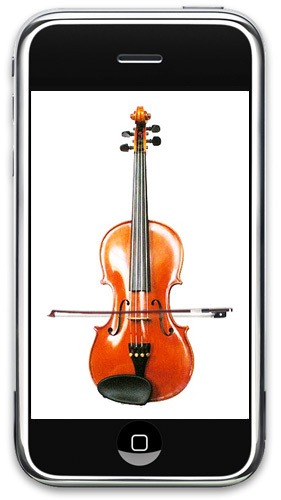 Play the world’s smallest violin on your iPhone or iPod Touch. An indispensable tool – useful for showing sympathy toward another’s misfortune, and more! You can play Tiny Violin by sliding the bow with your finger, or by shaking your device (be sure to enable Shake To Play). choose “speaker” or “both” (headphones & speaker). Note that because the first-generation iPod Touch does not have a built-in speaker, you’ll need to connect headphones to hear the sounds. Tiny Violin plays best when you slide your finger directly over the strings on the body of the violin. Tiny Violin will not produce any sounds if your volume is completely down, or your device is in silent mode. Still having problems? Drop me an email at gorbster at gmail dot com.